A new CCC analysis of first-quarter 2018 data reveals that about 12 percent of all appraisals included a reference to scanning the vehicle, an increase from just 4 percent in 2016 and 9 percent in 2017. However, OEM position statements showed that about 70 percent of appraisals in 2017 should have indicated a scan, according to CCC. Kia also issued a scanning position statement in June. When one throws out total losses, the percentage of vehicles carrying a scanning line item rises. The quarter saw a major spike to 19.3 percent of all repairable CCC appraisals receiving at least one scan, up from around 12.5 percent in the fourth quarter of 2017. But that’s still far below the 70+ percent it theoretically should be. 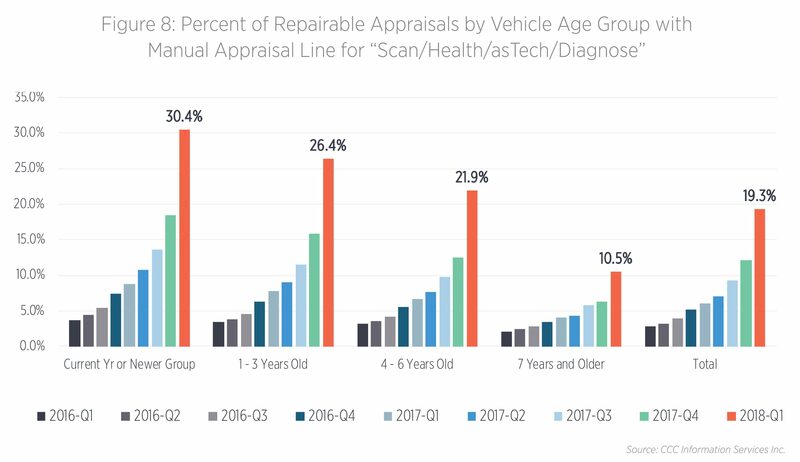 Unfortunately, while the percentage of scanned repaired vehicles still rose dramatically, the information suggests many shops still aren’t scanning vehicles 7 years of age or older. Which is foolish, since even the OEMs who specify a scanning date range set it back more than a decade — more than two decades, in Honda’s case. CCC’s data also suggests the cost of scanning a vehicle is falling. 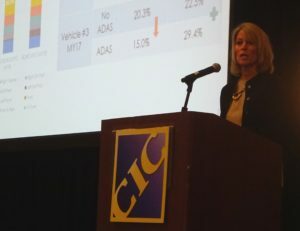 The first quarter saw an average pre-repair scan price of $63 and an average post-repair charge of $93, with a combined pre- and post-scan package going for $103, according to CCC. The 2017 “Crash Course” found an average pre-scan charge of $125 and the same average post-scan cost in 2016. Gotsch also has reported that the average scan line item carried a charge of $90 in 2017, down from $125 in 2016. CCC research also indicates that part replacement and calibration labor has held remarkably constant between the 2016 calendar year and Q1 2018. Both the 2017 Crash Course and the new report state that the average replacement and calibration item was 0.2-0.6 labor hours at $45 an hour per part. The July report did note that the median calibration sublet fee was $150 per claim. The average parts cost rose from $144 in the 2016 calendar year to $157 in the first quarter. 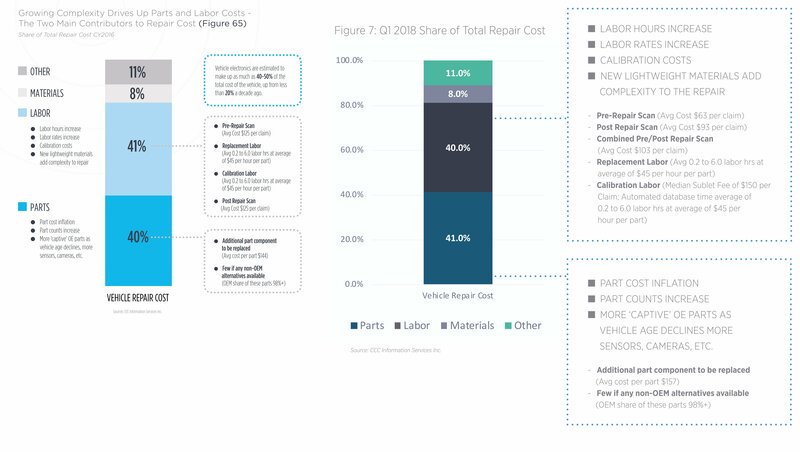 Parts also rose 1 percentage point to 41 percent of the average repair cost, while labor fell a percentage point to 40 percent between the two time periods. Direct repair program appraisals with a scan show a longer repair time in the first quarter, which is interesting. DRP repairers took an average of 10.5 days on scanned repairable vehicles, compared to 7.7 hours on all repairable vehicles, according to CCC. 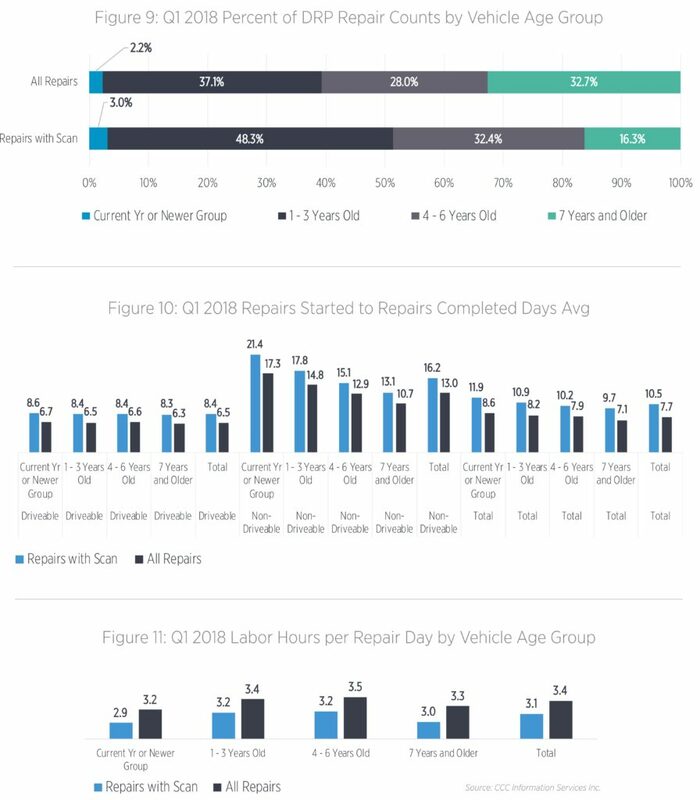 They spent only 3.1 hours per repair day on scanned repairable cars, compared to 3.4 hours on all repairable vehicles. This might not necessarily be a bad thing. The longer times might be a function of the scans detecting problems and shops fixing them, rather than unknowingly leaving the issues remaining within the customer’s vehicle. Repairers who are scanning cars are likely also to be more educated and possibly know to perform other operations dictated by OEM repair procedures. The extra cycle time experienced by the carrier and customer might deliver a higher-quality repair — i.e., it was worth the wait.